Finding the right engagement ring for your future fiancee can be a daunting task. There are so many styles and so many types of diamonds--how will you know which ring she likes best? Well, whether the love of your life is an old soul or a trendy girl, she’s bound to love an antique style engagement ring inspired by the Victorian era. Also known as the Romantic period, the Victorian era spanned the years of Queen Victoria’s reign in England, from 1836 to 1901. This time has become notable for its “refined sensibilities” or, in other words, its strict morality and formal societal etiquette. The jewelry of the era was similarly modest: delicate rings that reflected beauty in a subtle way. However, you may notice that Queen Victoria’s reign lasted quite a while. The Victorian era saw fashion changes as time went on, including different jewelry styles. Victoria cast aside her simple, subtle jewelry after the deaths of her mother and husband, favoring large, grandiose jewelry often featuring gemstones in rich colors instead. This is one of the beautiful things about Victorian inspired jewelry--with a fairly wide variety of styles, there’s bound to be the perfect engagement ring for any bride! At the start of the era, most Victorian style engagement rings mirrored the ring Victoria herself received from Prince Albert. This ring featured a single emerald and a yellow gold band that resembled a snake (snakes were considered a symbol of eternity). Similar designs popped up in the fashion of the day; bands were decorated with symbols of romance, from hearts and flowers to bows and arrows. As Queen Victoria shifted into grander, more elaborate jewelry, ring designers followed suit. Filigree of abstract patterns began to decorate the bands, the diamonds and gemstones became bigger, and settings became more extravagant (think halos or clusters of diamonds). Many modern designs are similar to the styles Victoria wore during this time in her life. Victorian style settings put emphasis on the decorative patterns on the metal, featuring everything from floral filigree to depictions of lovebirds in flight. Yellow gold was the most common color for many years, although increased trade made silver a viable option near the turn of the century. Diamonds were difficult to come by in the 19th century, many ladies wore a ring with their birthstone as their engagement ring instead. However, Queen Victoria was particularly fond of opal, and so this stone became wildly popular. Of course, the diamond ring is a staple of our wedding culture today. Diamonds did become popular during the Victorian era, especially after the South African diamond rush. At that time, the old mine cut--now known as the cushion cut--was in vogue. Adding opals or other colored gemstones to the band alongside a cushion cut diamond is a great way to pay homage to the Victorian style engagement ring. 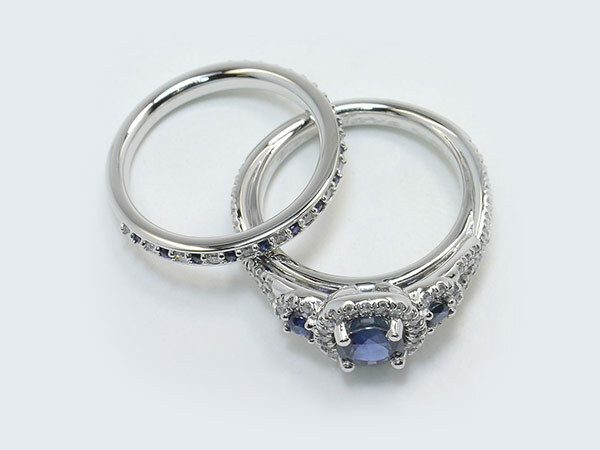 What is most important when you’re looking for a Victorian style engagement ring is the overall aesthetic. This ring should be beautiful (either subtly or extravagantly) and feminine, decorated with delicate filigree or opulent gemstones, and it can feature either a single diamond or a cluster of diamonds and gemstones. Create the ring of your dreams. The best way to find a Victorian style engagement ring that’s right for you is by customizing it yourself!